c.1900, counter top cast iron wrapping paper cutter w/wood frame, for 24" rolls, often used for meat wrapping, a nice item from days when you purchased your items from a local grocer/butcher. 28.5x11.5"
c.1950. 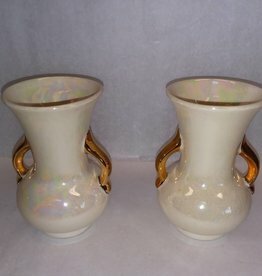 Hand painted Napcoware egg vase w/gold trim. Marked: #C3188/L. 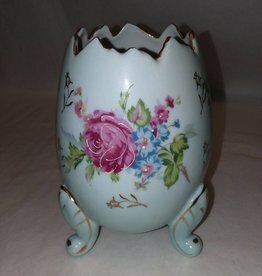 Beautiful roses decorate this robin egg blue vase. Nice coloring & condition. 6" high. c.1900. 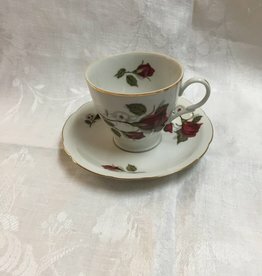 Miniature teacup & saucer. 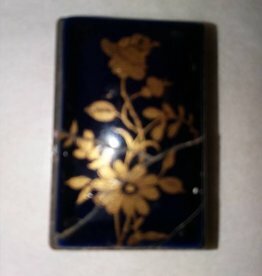 Gold trim w/floral design. Marked & numbered. Germany. Excellent condition. C.1950. 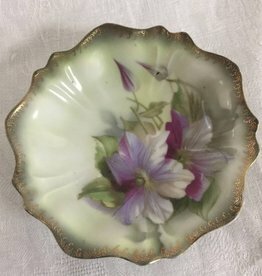 Gold trimmed Fine China cup & saucer marked Camielow. Made In Poland & #'d. Very tiny flea bite on lip of cup. 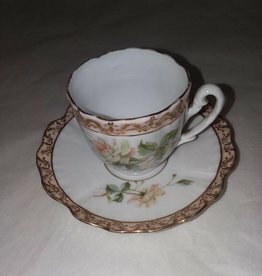 Elizabethan Fine Bone China Teacup & Saucer. Numbered 2383. Made in England. Multiple colored leaves. Gold Trimmed. Very nice condition. 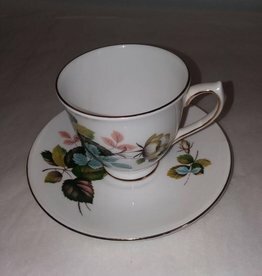 Royal Albert Bone China. 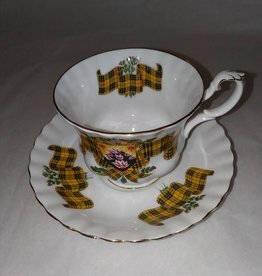 Teacup & saucer w/plaid family crest & colors. MacLeod. Gold Trimmed. Scottish Tartan Series. Excellent condition. 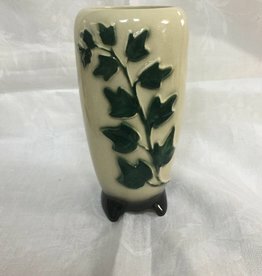 E. 1950's, Cream w/green Royal Copley Ivy vase. Black base. 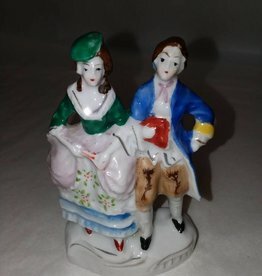 Crazing of finish due to age, 8.25" tall, overall in very good condition. c.1950's. 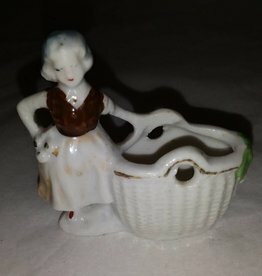 Mini matchbox w/porcelain top. Brass with cardboard insert. Top is cobalt blue w/applied gold. Top is slightly damaged. Overall in very nice condition. 1 3/4x1 1/8". 1930's. Royal Porcelain Bavaria Cobalt Vase/Pitcher. Hand-painted w/applied gold, KPM Germany. #20. Very nice condition. 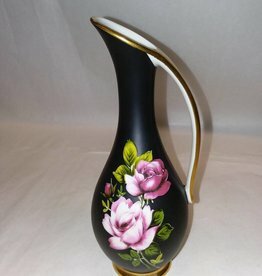 8"
Hand Painted, KPM Germany Porcelain Pitcher Vase, w/Applied Gold, 1930's, 8"
L. 1800's. Set of 4 porcelain sauce dishes. Floral design. Each dish is 5"x1.25" Marked RS Germany on bottom. 1 fleabite on rim of 1 dish. Overall in very good condition.